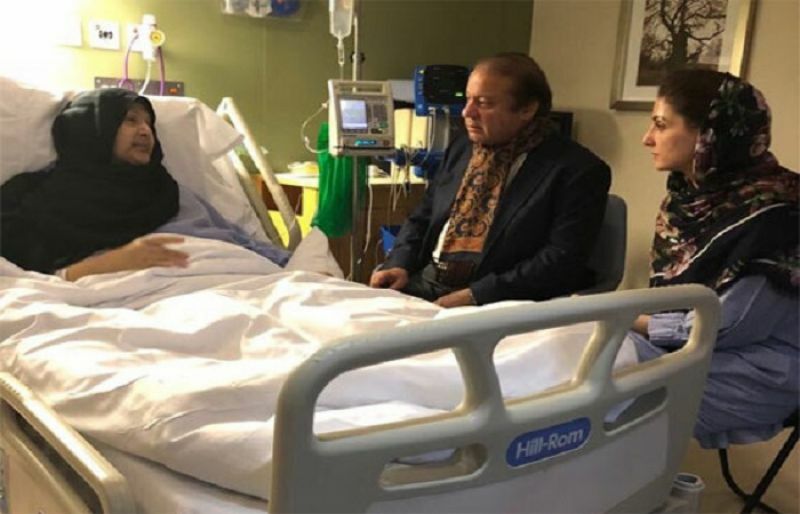 Former premier Nawaz Sharif has said that his wife Kulsoom Nawaz’s condition has slightly improved, but she still remains unconscious and in critical condition. Nawaz, in an interview to BBC Urdu, expressed regret that had he visited his wife before last Thursday, he would at least have been able to find her conscious. “[Begum] Kulsoom’s condition is better compared to before. [I wish] I had [reached here] before [last] Thursday, she was at least in a conscious state then,” he said, and requested for prayers for his ailing wife. Hussain further told BBC Urdu that his mother’s condition was comparatively better than last week. When asked how his father was handling the situation, he passed the phone to Nawaz. During the five to eight minutes conversation, Nawaz requested prayers for Kulsoom’s health. BBC Urdu further stated that Nawaz’s tone was gravely serious bordering with sadness. He expressed genuinely positive remarks about Pakistan and the nation before concluding the conversation. On Thursday, Maryam Nawaz told media that her mother’s condition remained critical. The ex-prime minister’s wife was admitted to Harley Street Clinic on June 14 after suffering a cardiac arrest and has been on life support since. She had been undergoing treatment for throat cancer during the past few months. Nawaz and his daughter, Maryam, reached London the same day to tend to Begum Kulsoom.